A woman and her baby were killed when a tree fell on their house and at least two other storm-related deaths were reported Friday as Hurricane Florence slammed into the Carolinas, dousing the eastern US states with torrential rain and causing rivers to burst their banks. 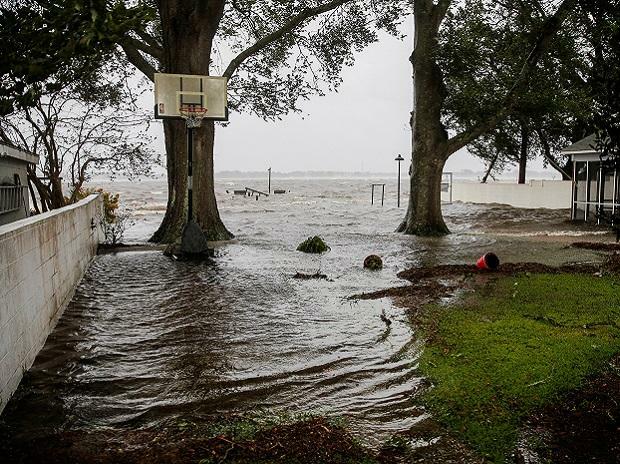 Hundreds of people needed to be rescued after being trapped in their homes by a storm surge of up to three metres in New Bern, a town of 30,000 in North Carolina at the confluence of the Trent and Neuse rivers. At 2100 GMT, Florence was downgraded to a tropical storm by the National Hurricane Center (NHC) but authorities warned the danger was far from over. He said there had been three confirmed deaths from the storm and several others were being investigated to determine if they were storm-related. The mother and her baby were killed in New Hanover County when a tree fell on their house, the governor said, and one person died in Lenoir County while plugging in a generator. Local authorities reported another death, in Pender County, when downed trees prevented emergency units from reaching a woman with a medical condition. Local media said she had suffered a heart attack. US media said a fifth death may have occurred when a man tried to connect two extension cords in the rain. "This storm is going to continue its violent grind across our state for days," Cooper said. "The storm is wreaking havoc on our state." More than 680,000 customers in North Carolina were without power and 21,000 people were being housed in 157 shelters across the state. As of 2100 GMT, maximum sustained winds had weakened to 110 kilometres per hour but the NHC warned Carolina residents to be alert for life-threatening storm surges and "catastrophic freshwater flooding." "We're deeply concerned for whole communities which could be wiped away." Some of the worst floodings was in New Bern, where authorities were enforcing a curfew. Besides federal and state emergency crews, rescuers were being helped by volunteers from the so-called "Cajun Navy" who also turned up in Houston during Hurricane Harvey to carry out water rescues. Hurricane Florence made landfall as a Category 1 storm at 1115 GMT in Wrightsville Beach, North Carolina, after stalking the Carolina coast for days. The NHC described Florence as a "slow mover" and said it had the potential to dump historic amounts of rain on North and South Carolina, as much as one meter in some places. "Our house is on high ground so we're not worried about the flooding," he said. "But there are a lot of big trees around so we preferred to spend the night at friends to be sure. A state of emergency was declared in five coastal states -- North Carolina, South Carolina, Georgia, Maryland and Virginia.